Kai Stietenroth was at home in the world. Two passions dominated his life: Travelling and development work. Kai visited all continents by different means of transport. His major tours included a mountain bike trip up the Karakoram Highway, a 9-months cross-Africa tour with a truck and a year-long motorcycle tour from Germany to Australia. His last big journey labelled „Myth of Timbuktu“ led Kai and his international team along the original routes of the great Sahara explorers. Kai shared his adventures and experiences in articles and talks with the interested public. Furthermore, he was an excellent photographer. He founded a slideshow festival eleven years ago that developed to one of the biggest events of its kind in Germany over time. A medical doctor by training, Kai specialised in international health and worked in humanitarian and development settings in South Sudan, Afghanistan, Pakistan, Bangladesh and Yemen for various organisations. Kai’s humanitarian engagement moved many people. Wherever he worked, he impressed colleagues and partners alike with his moderate and diplomatic style, whilst preserving critical distance and high professional quality standards that he also applied to his own work. 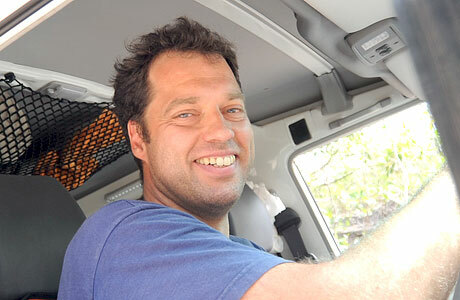 Kai unexpectedly died during a brutal terrorist attack in Sana’a, Yemen, on 5th December 2013, aged 43, where he had an assignment with the German International Cooperation, GIZ. Kai's condolence homepage is initiated by his close friends and family.